Spring is finally here, despite what the weather outside is doing. Spring in Portland and the Pacific Northwest can bring on some angst for local deck owners when it comes to home deck maintenance. For those homeowners living with the latest technology in decking (capped composites or PVC) this anguish may be minimal. Anyone still owning a natural wood deck may be looking forward to a few weekends of hard labor to get their deck and railings ready for the usable season. Many of today’s man-made materials offer low maintenance as an owner benefit. What exactly does this mean? 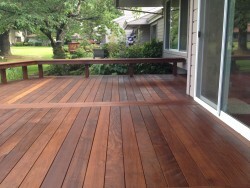 In short it means that your days of stripping, sanding and sealing wood decks will be over. However, cleaning will still be vital part of maintaining your decks. With a regular cleaning schedule the effort required will be minimal. What do we mean we when say clean: Our recommendation is easy – a 5 gallon bucket of warm soapy (dish soap) water and a push broom or deck brush. If you keep to a regular cleaning schedule, that is all your will have to do. Just soak the deck with water, scrub the soapy water on gently and wash off with a hose. If you tend to let your deck become a bit more soiled between cleanings, composite manufacturers have heavier cleaning recommendations on their websites. With a proper cleaning schedule, your capped composite or PVC deck should last your for many years and essentially look like new after each cleaning. The spring cleanings are by far the most important of all, which is why we recommend it twice during this time of year. As trees and plants begin their growing season they fill the air with pollen, and this combined with the copious amounts of rain can create a slick and unsightly glaze on your deck surface. Our recommendation is to clean the deck once after the Pollen begins to fall, typically your “wake up” cleaning for the deck season and then again after the Pollen has stopped falling. These two cleanings alone will keep your capped composite or PVC deck boards clean most of the summer. The next cleaning will be recommended based on usage. Three Rivers Custom Decks recommends that you clean your deck at least once during the summer use season based on how your deck looks. If you use your deck a lot, you will possibly have to clean it more often. If you use it less frequently, once during the summer should do. Finally after the summer use season is over, one more final cleaning for the year is recommended to “put the deck to bed” for the winter. Although you may use your deck throughout the year, cleaning it before the winter rains set in is a good idea to cut down on organic material that may become slippery when wet. For those homeowners who have opted for the undeniable beauty of natural wood, your cleaning program is a bit more involved. Keeping to a similar cleaning schedule as described with the capped composites and PVC decking is important, but to maintain the wood and protect it from rot you have to go several steps further. Typically wood decks will require a sealer of some sort to protect against moisture and UV rays. Let’s look at the 3 most popular natural deck surfaces in the Portland Metro area. Although fewer and fewer Cedar decks are built each year, it still remains the go to for customers whose initial budget is limited or just prefer the rustic look. Aside from period cleaning, cedar will require yearly or every other year stripping, sanding and sealing. Stripping is typically accomplished by soaking the deck with water and then aggressively pressure washing the surface. We at Three Rivers Custom Decks recommend hiring a professional for this part unless you are experienced with a pressure washer. 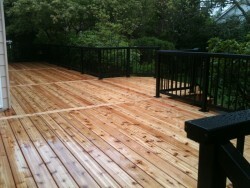 After the stripping process, allow 2-3 days for the deck to dry. Follow this up with any necessary sanding to remove imperfections. After sanding, wipe the deck down to remove any dust or debris. Mahogany follows the same basic guidelines as cedar, although you may have to strip and seal less frequently, about every two years. Most of our customers have been happy with an oil based hardwood finish on mahogany decks. Most of our customers have been happy with an oil based hardwood finish on mahogany decks. As with tight knot cedar decks, Messmer’s is a customer favorite. While IPE does not actually require sealing, most of Three Rivers Custom Decks customers want to preserve the beauty of the wood by doing so up to twice a year. Allowing the deck to age will result in a silver/grey surface that is perfectly fine, but does require a good cleaning and scrubbing a few times a year to wipe away and surface material that has begun to decay. If you choose to preserve the natural beauty, Three Rivers recommends that you sand and oil the deck shortly after installation and again a few months after. The intent is to build up a nice base of oil over the surface as IPE’s density does not allow for much penetration. Three Rivers Recommends re-oiling as often as the appearance calls for, when the oil starts to look worn down in high traffic areas. If you allow the oil finish to wear down to bare wood, it becomes more difficult to regain a consistent appearance in the surface. Oiling before you think you need to is considered a good practice. As with Mahogany, we recommend using an oil based Hardwood finish. 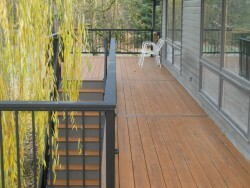 Most of the decks installed by Three Rivers Custom Decks in the Portland Metro area include some kind of railing. The vast majority of these railings are powder coated aluminum. The cleaning of a powder coated aluminum railing is fairly simple if done regularly. As with capped composite and PVC decking, warm soapy water and a gently brush are helpful. Many customers use a light pressure washer to clean their railings of dirt, pollen and other airborne debris. Once clean, applying a good coat of car wax over the flat, horizontal surfaces is a good practice. We at Three Rivers Custom Decks hope you enjoy the upcoming deck season. If you have any questions regarding your existing Three Rivers Custom Deck or would like to inquire about an installation, don’t hesitate to contact us.